Today the online world is buzzing about one thing. Water. Why? I'll tell you why. Because the water and sanitation crisis claims more lives through disease than any war claims through guns. 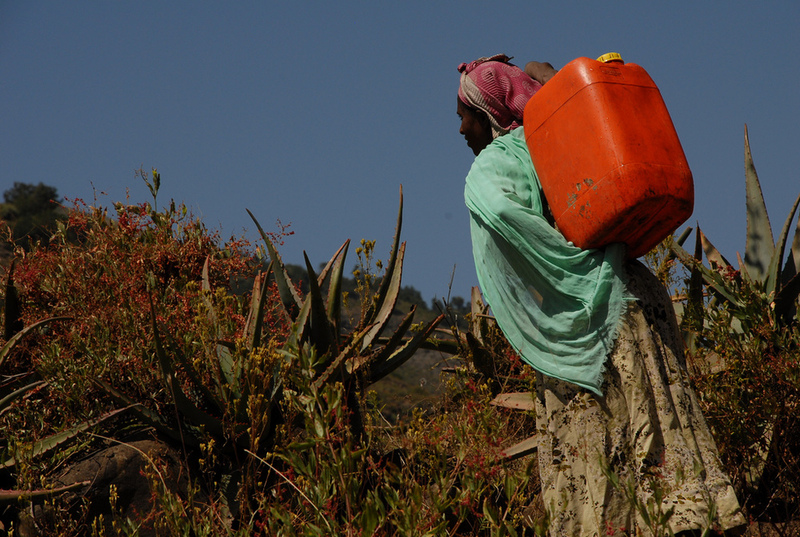 Because women in developing countries walk an average of 3.7 miles a day to collect water. Because more people on earth have cell phones than toilets (Read this case study of India). Because over 200 million hours of labour each day are consumed just to collect water. Because investment in safe drinking water and sanitation contributes to economic growth. For each $1 invested, the World Health Organization (WHO) estimates returns of $3 – $34, depending on the region and technology. Because we should be outraged by these numbers and figures. Need more reasons? Read here for some more hard hitting facts. Now I've been watching videos and looking at photos related to water all of this morning as a way of getting myself inspired to write this blog post for Blog Action Day. And in almost all those videos and photos, there's a little snapshot of clean water flowing and all I could think to myself was, "Dear God, that water is beautiful". And it's something that we in developing nations take for granted every single day. And I'm not claiming to be the exception. I take extremely long and hot showers and yes, I leave the tap running more often than I'd like to admit. Let's face it, water isn't something I (or you) think about every day. We don't sit at the end of the day and thank any higher being for granting us access to this amazing natural resource. It's just there. And it'll be there tomorrow. But then I watched this video from the good folks at charity: water and it made me think twice. What if our city's taps went dry? What would we do? It's a startling look at what people go through every single day and it's something that could so easily be affecting us. So what are you supposed to do now that you know this? Take time to look at the water flowing out of your taps at home. You couldn't possibly imagine what it would be like to have to drink and bathe in contaminated, dirty water. Be thankful and be more aware next time you leave that tap running. Educate yourself on the water and sanitation crisis that we're currently in the midst of. This time be the educator and tell your friends. Donate to non-profit organizations and charities that work to bring developing nations access to clean and safe drinking water. The following is a list of organizations that you can learn from and get involved with to help fight against our water crisis: water.org, charity: water, Wine to Water, The Water Project, Circle of Blue, End Water Poverty, Water for People, Imagine H20, The Samburu Project.